The Arthashastra is an ancient Indian treatise on statecraft, economic policy and military trategy authored by Chanakya (350-283 BCE). Chanakya, also known as Kautilya or Vishnugupta, was an adviser and a prime minister to the first Maurya Emperor Chandragupta, and architect of his rise to power. Other important works of Chanakya are ‘Chanakya Sutras’ and ‘Chanakya Niti Darpanam’. Thank you very much.In this age of extreme commercialism, god bless you (if you believe that is) for providing these rare books for free! thank you very much! i never thought i can get these books for free ….great work! Thank You very much Sir, this book is great indeed! Thank you very much for providing such a great book …. so that person like me can read it .. Thanks a lot for your great deed. I am sending you the book “Arthashastra of Chanakya – English Translation” by email. I checked the download link. It is still working without any problem. I really wanted dis book.. I can’t express my gratitude in words. I’m speechless to get this original script which is a great trasure a student of Politics like me. Thanks a lot. Kindly publish other such scripts in scanned form e.g. Veda, Upanishadas n so on. Thanks a ton! You are doing a great service by making it accessible to all interested. It is a book of real substance which truely opens up your mind. Really appreciate..
Is the following verse from Kautilya’s Arthasastra? If not, what is its source? I wanted to know name of the shastra which contain about weapons and physics.By this I wanted to improve this Bharatadesa in modern techniques. Help me Please.i am not able to download the english book. Will Someone please send me the download link? 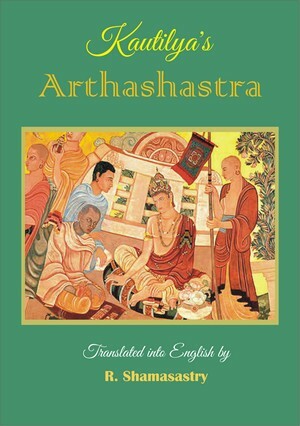 I have rectified the link to Arthashastra English. You can download it now. Please help me to download this great book. Thanks in advance. Thanx a ton, its a great book & a splendid work done by making available the wonderful ebook.Once a Thanx alot. I can understand how much this book has been imbibed by you, by this very act of making this Gem of books freely available to the seeker. You are a person i would like to associtate with. Thankyou Friend. Hi five!! I could not download the sanskrit version. could you please check the link ! Thankyou i got it ! Glad to know that you could download the file. I have added new links to 3 volumes of Arthasastra with Sanskrit commentary by T Ganapati Sastri. Thanks a lot for offering such a rare book without charge. thanks you very much.this is a rare book which i’ve being searching and it helped me a lot. could you please help me in finding chanakya’s nitishastra. Thank you very much for the book. God Bless!!! Thanks a lot. My whole Hear-ted Thanks. I wish you all the best. Thank You once again. Thank you so much for posting such a great book for free! For some reason I am ot able to download the book via your link. Could you kindly email me the English Translation to “rakave@gmail.com”. pls send me a email like of the artha shastra the english translation. Thanks for the Link/ pdf. Just downloaded and going to start reading!!! A very good contribution….. God bless u! Thanks for this priceless treasure! Sir Can you please send me email liink of the artha shastra the english translation. Thanks for the great help. Cant ask for more. thanks is a very small word to express but from the core of the heart thank you so much for this great work. downloaded Kautilya Arthasastra. priceless efforts. Loved the blog and thanks for the great book..
Do you know/ have RP Kagle’s Book on the sunject please?? Out of 3 volumes of Arthasastra translation by RP Kangale, first two are available at Digital Library of India. Links are given below. kautiliya arthasastra pt.2., 99999990840951. kangle, r.p.. 1963. english. ancient india, economic conditions. 640 pgs. the_kautiliya_arthasastra_part_1., 2020010008652. r p kangle. 1960. sanskrit. NULL. 388 pgs. also im more interested in Part III of the book .. I have not seen volume 3 Arthasastra translation by RP Kangale anywhere on the internet. I will let you know if I find it later. Since I don’t know Telugu, I cannot help you much in this matter. sir the link to download the Sanskrit edition is volume 1 2 3 right? but I have a doubt are they separate each analysed by separate authors or all are by same author! kindly reply! I wan to download the Sanskrit edition! also if they are of same author then till volume three u have uploaded right is it the end of arthashastra or more to come? Aniruddh, They are 3 volumes of the same set. They contain Arthasastra with Sanskrit commentary by T Ganapati Sastri published in Trivandrum Sanskrit Series. This Website is Amazing could get the Arthashastra book . great job by the creators of this site , please update us with the older things and our country’s history .And Thanks for the free E books . Dear Sir, thank you very much for providing precious books for all of us to read, here I am requesting if possible for you, kindly also provide books on Vedas (in detail or in brief elaborating). Thank you so much. Please keep updating us any precious books uploading by you to learn by us more about Indology and Dharma. Thank you for Arthashastra pdf, one can get excellent touch of our vedic culture.. since it will be great if we can get in other languages too. Kindly please help me to get Arthashastra in TAMIL PDF form. Sethu, I have not seen Tamil Arthasastra anywhere on the internet. thank you for helping curious minds like us, and keeping alive age old traditions of india by providing such books to today’s youth, who hardly get any knowledge of ancient india’s richness in philosophy,science,culture,economy,etc. due to dominance of western culture, philosophy and ideology. Thanks for such a great book for the World. Thank you very much.It helps me in my rehearse work on Hydrology especially on rain gauges, rules and duties to be carried out by the king with respect to building of tanks, taxation on Agricultural products, Rain forecasting, Soil of various categories etc., It is worth here to say that was referred to say that Hitler used to refer every day this great work and implemented most of the rules and regulation in Germany during his tenure. Secondly it was first discovered Sri Shyama Sastry at Mysore Oriental Library. Thirdly when Nalwadi Krishna Raja Vodeyar visited Germany it was through this book he was recognized as Indain King belongs to Mysore State. When Vodeyar himself wonder stuck to hear the name of GREAT SCHOLAR Sri Shayama Sastry. After returning to Mysore he searched for the SCHLOR SRI SHAMA SHAYAMA SASTRY and honored him as Asthan Widwan! It is because of this great Schlor The Mahan Kautilya was brought to light of the World Areana. I thank Sri Ganapathi Sastriji and you also for re-establishing the Vision and Visdom of India to publish in this Media. Dr.Harihara Sreenivasa Rao, Hydrologist, Bangalore. Thanks indeed for sharing the link. Was wondering if there is an institute that teaches complete Arthashastra through online or maybe the traditional classroom? Finally, is there a link available to the english translation of Chanakya Neeti Shastra? If so, kindly share. Farhaan Ahmed, I have not heard about any institute that teaches complete Arthasastra. It could there in the syllabus of PG courses in political science. You may post a query at Bharatiya Vidvat Parishat Google group (https://groups.google.com/forum/#!forum/bvparishat). Scholars of this group will help you. THANK YOU FOR FREE DOWNLOAD SIR.IT SHOWS TO THE WORLD THAT,WISDOM IS NOT ONLY REGULATED TO A CERTAIN RACE,RELIGION,CLASS.BUDDHA,ASOKA,CHANAKA.KALARI PAYUTTE.THANK YOU MOTHER INDIA. Thank you very much for providing these gems of India online for free. You are doing great job. Please keep it up. Wish you all the best. Thank you once again. can anybody tEll me how many slokas have in arthashastra? Priyambada, Arthasastra is a prose text. Arthasastra has 15 chapters (adhikaranas) and has approximately 500 pages. I like this arthasastra books in English version could you please send me the Tamil version pdf file. Could you please send me a copy of file in the book of arthasastra in Tamil version email id: rameshnarmy@gmail.com. Thnx for the priceless stuff. I’ve just got the book, is it all ?? Or is it having any more volumes ?? I know it’s totally stupid to ask you like this,but I’d be very much thankful to you. You can write me on WhatsApp @ +91 9494826558.
or please, suggest me a book where I can get the meanings of the above words!!. 👍 Thnx for writing back. I’m checking what the link you gave.. Thanks for your concern, could you tell anybook that contains Sanskrit plant names, please.. Cause, all the three (Trinemri, Raagini, Vetrayasti) I wrote above are plants. I guess!! While searching in online dictionaries, spelling is very important. Vetrayashti is there in Monier Williams dictionary. Vetra-yaṣṭi, is, m. f. a staff of reed or cane. Ragini is Ragi (finger Millet) as per Sabdataravali, a Malayalam dictionary. I could not find the meaning of Trinemi (I think this could be the correct name). In addition to the above there a number of books on Indian medicinal plants. You can find details by searching at worldcat.org. For such queries, the best place is Bharatiya Vidvat Parishat Google group. If you post a query in the group, the learned members of the group will help you. Thank you so much genius man!! I’ll find my way to thank you.. 😉 don’t freak out..
I’ll get you some good books in a couple of months. See ya! !